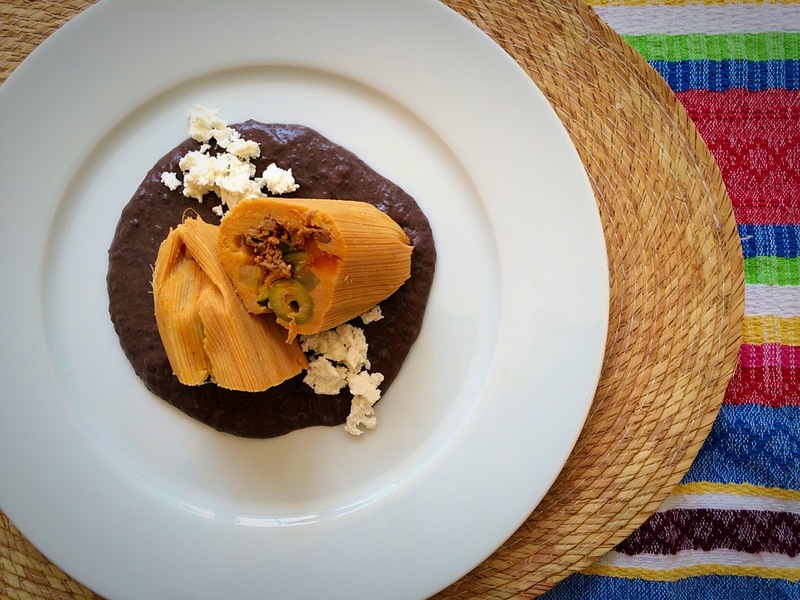 I think everybody in the world has a family recipe, a recipe that it is very special, a recipe that nobody else does or knows and this is the case of my tamale recipe. It belongs to my mum’s family and it has been with us for generations. Cooking the meat: In a casserole dish put the piece of meat with the tomato, onion, garlic, bone marrow and salt to taste and add water until the meat is covered. Cook for 20, while is cooking remember to remove the impurities (the frothy broth that forms on top). When the meat is cooked, remove it from the broth, leave the beef broth aside and shred the beef with your hands or with the help of a fork. When it is all thinly shredded, cut it into small pieces and set aside. Cooking the Guisado (beef filling): Use a big frying pan. Heat the oil and add the tomatoes, onions and green pepper. 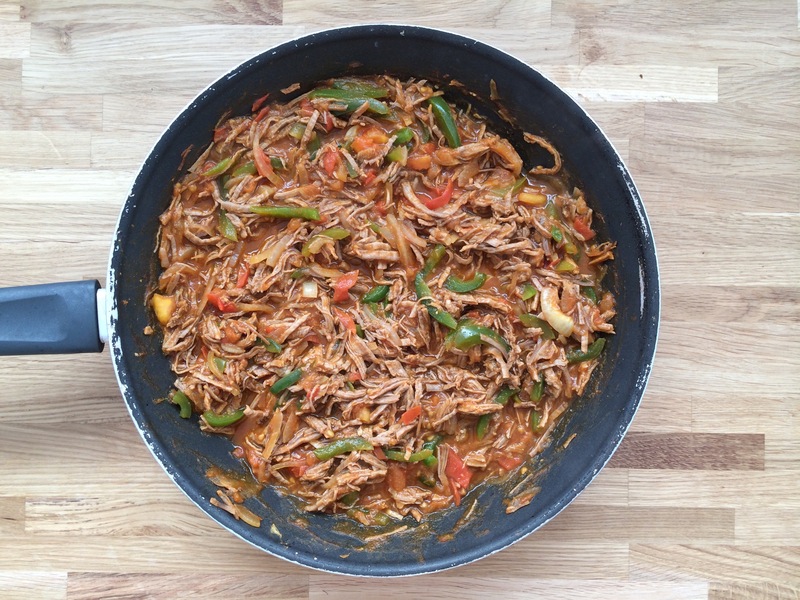 After 7 min add the shredded beef and cook for 5 min more. Then add some of the California chili sauce to give some flavour. Use 50 ml of the beef stock, add a spoon of maseca flour and add it to the Guisado. Taste if it needs salt and cook for 5 more min and set aside. Preparing the extra ingredients: Chop the potato and cover with water so it doesn’t darken, chop the carrots and the courgettes the same way as the potatoes. Have all the ingredients ready and put them aside. Soak the corn husk leaves in water for around 1 to 2 hours so they are manageable. Once they have been soaking for a while, separate the large leaves from the small ones. You will use the large leaves to wrap the tamales and the small ones to make strings. 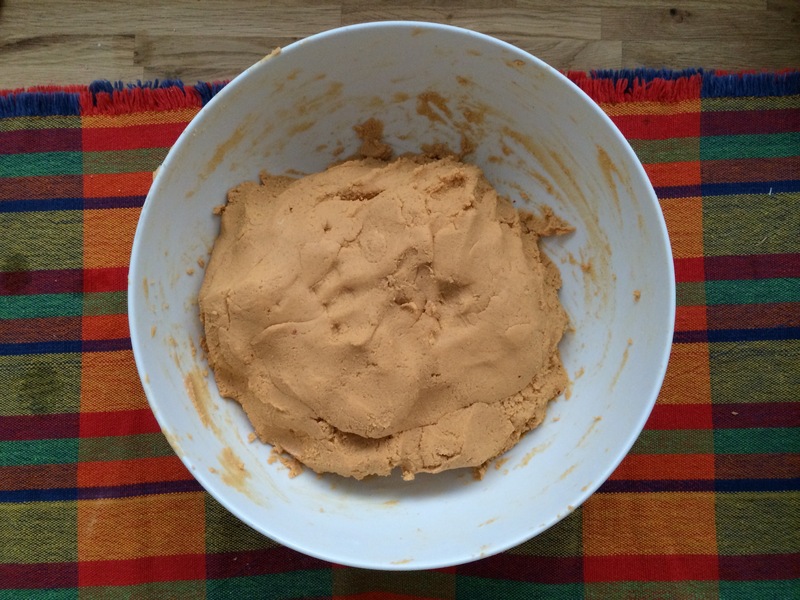 Preparing the dough: To prepare the maseca dough you will need a big bowl. Melt the pork lard either in the microwave or on the hove. Have the ingredients ready to get them mix in the big bowl. Add some of the luke warm water and mix, then the rest of the California chili sauce and the rest of the beef broth. Work the dough until all the liquid has been absorbed then start adding The piel lard and continue mixing. The dough will tell you if it needs more water, it has to be firm and not sticky, taste the dough for salt, if it needs salt add it at this stage. 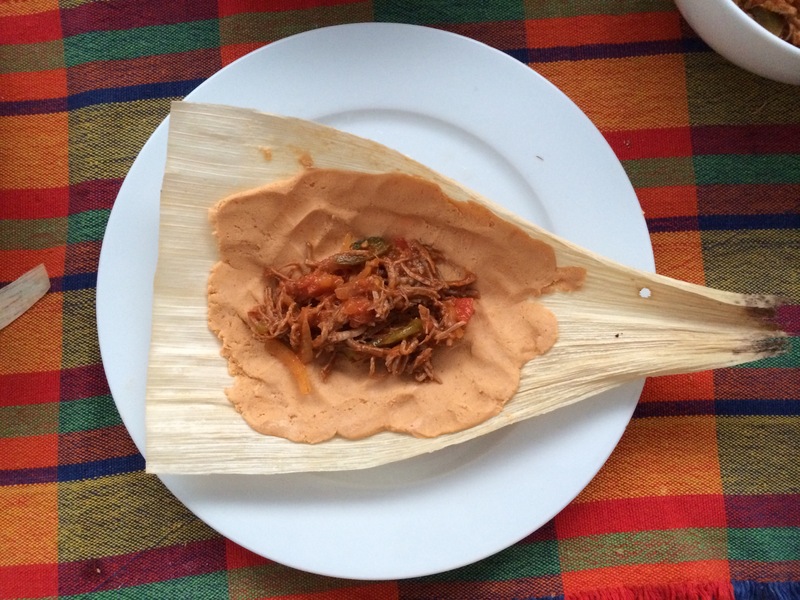 Assemble the tamales: Take a large corn husk leaf and add some masa (dough) and spread it over the leaf, you can do it with the help of a back of a table spoon or with your hands. Add some beef Guisado, one or two sticks of each vegetable, one olive and a jalapeño slice. Wrap the filling with the corn husk leaf and tie a knot at each end with the corn husk leaf strings you made earlier. 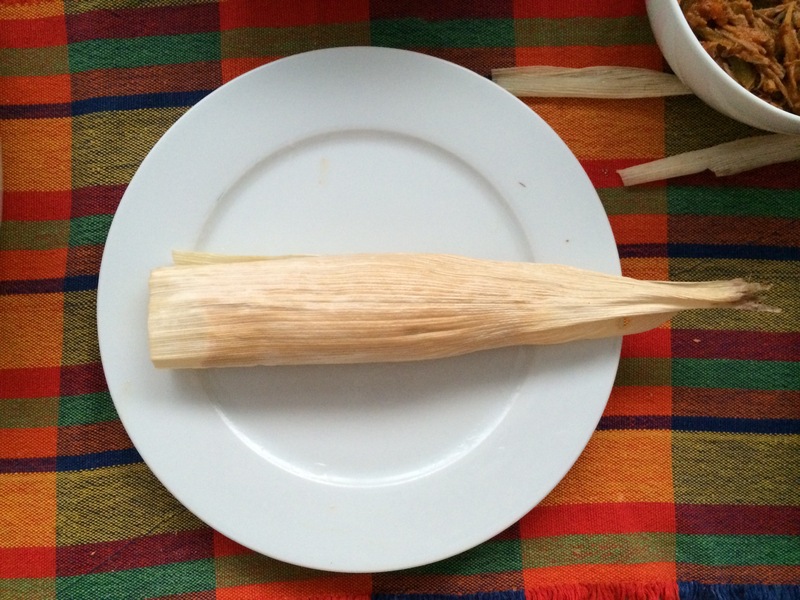 Repeat the procedure for each tamal until you run out of dough. To cook the tamales: You can get a special tamal casserole or you can improvise one, like I did. On the bottom of the pan put 1L water with salt, put a little ramekin up side down and a plate on top of the ramekin, lay some leftover corn husk leaves then lay the tamales like in the picture, covered them with some more leftover leaves and close the pan very well (very tightly). Cook with high heat for 10 min then turn down the heat very low and cook for 1 hour and 30 min. Before turning the heating off, make sure they are cook, take a tamal out, give 2 min to cool down first, cut the strings, open it and if it comes out of the leave easily, that means that is cooked if not, continue cooking for 30 more min and check again until cooked. Any questions don’t hesitate to send me a message.